Phase two of London’s Quietways scheme has been announced. The mayor’s office has revealed segregated cycle lanes and junction changes will now extend to all 32 boroughs, with work on a “significant number” of the projects to be underway by 2016. The Quietways scheme is intended to target “cycle routes on less segregated roads on streets with less traffic”. Proposals in phase two include a segregated cycle route along part of the A316 and improvements to the existing Cycle Superhighway 9 (CS9) in Hammersmith & Fulham and Hounslow. New cycle crossings are due to be installed on the A406 North Circular Road at Neasden and near Ilford, while Abbey Wood station will get a new cycle “superhub” and improved links to Thamesmead. 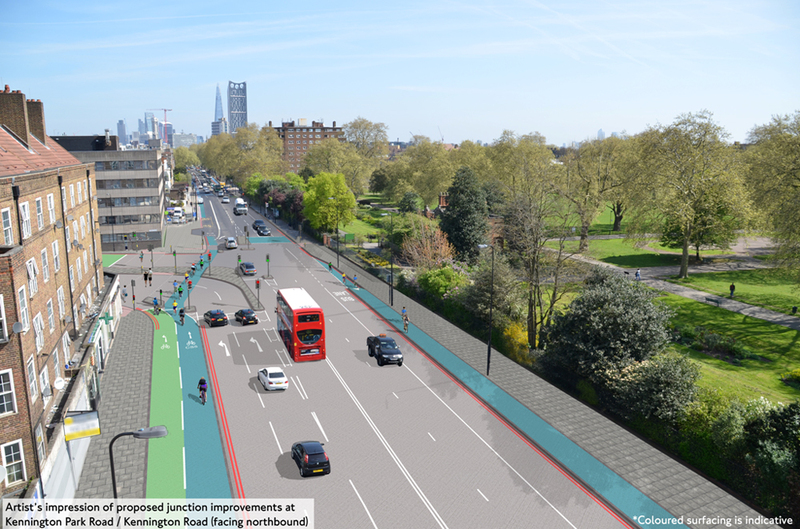 The announcement comes as work is set to start on improvements to the Oval junction, in south London — the first of 33 major junctions which will be radically reshaped to make them safer for cyclists. The works will install segregated tracks at Oval, which is on Cycle Superhighway 7 to separate cyclists from traffic and buses. Four junctions in the area will also be radically redesigned to include two low-level signals, built specifically at the height of cyclists to help provide an early start for bikers. Innovative “hold left turn” and “two stage” right turns for cyclists will also be delivered to further reduce conflict with vehicles. The Mayor of London, Boris Johnson, said: “We know that most serious bike and pedestrian injuries and fatalities occur at junctions. That’s why we are overhauling some of the worst examples of these 60s relics across London. Since Cycle Superhighway 7 was launched in 2010, the number of cyclists using the route has increased rapidly, with more than 2,400 bikers an hour using the route during morning and evening peak travel times. A “significant number” of the new projects in phase two are expected to get under way by 2016. The latest development follows the announcement of two new Cycle Superhighways in the capital, including an 18 mile continuous East-West cycle route, dubbed the “Crossrail for Bikes”. Transport for London (TfL) says the routes chosen, which will link up with Quietways and other Cycle Superhighways, have seen a reduction of around a quarter of motor traffic in the last ten years. On Victoria Embankment, where the East-West Superhighway will replace a traffic lane, motor traffic declined 24% between 2004-2013, while in places 15% of vehicles are bicycles.